A barrage of bullets could not stop the blood-thirsty ghoul from escaping in his black hearse – is he man or vampyre? Young Thomas Fielding, nephew of the Chief Magistrate, stumbled across the villain and gave chase. 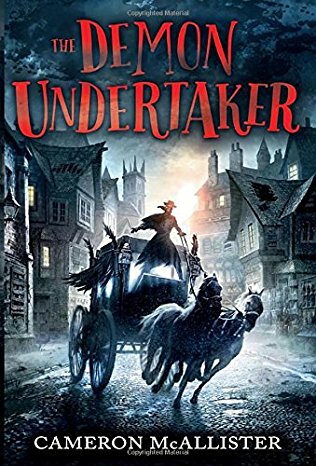 Can Thomas and his team of Bow Street Detectives save Lady Grace and catch the Demon Undertaker before he snatches his next victim? If you have ever read 'The Tin Snail' by Cameron McAllister, which is his debut book, you should know that you are in for a real treat with this one. The Demon Undertaker will be his second book to date. It really is pitch perfect for that special time coming up - Halloween - which we all love, isn't that right? This book will thrill you and delight you from the very first page to the last. It is a brilliant and captivating read that will transport the reader back in history. You will hurtle back in time to 18th century Georgian London; a period of big social change and some very gruesome goings on. These are described and used to good affect in this fantastic story. It is lightening fast, stage coach of a ride. It has a brilliant plot that reluctant readers will love. Packed full of mystery adventure, you will be engaged with London's first ever team of detectives known as the Bow Street Runners; the first professional police force in London. Founded by Henry Fielding, they originally numbered just six men. This is the seed to a plot which is full of macabre moments. It is a fantastic detective mystery to uncover, but you should only do this at your peril. Every page transports the reader into an enjoyable and fantastical reading experience. The setting is written particularly well and suggests that a lot of research has gone into this book, in order to get the details authentically correct. The characters have a lot of charisma and sparkle. Whilst the hero and heroine will leave you with your heart in your mouth many times throughout the story. As you follow the narrative in this gothically disturbed world, you will give chase in pursuit of a bullet dodging, blood-thirsty ghoul that will have you running round London until the very climatic ending. This is a fantastic five star read and is one of my favourite books this year. It has everything that I love and look for in a book. There is a mystery to uncover, which is full of gruesome adventure, facts blended in with fiction, great characters, as well as a detailed and atmospheric gothic type setting. It has a spooky and supernatural undercurrent with a fantastic ending. I'm now hoping for another story to run along side this one from Cameron!